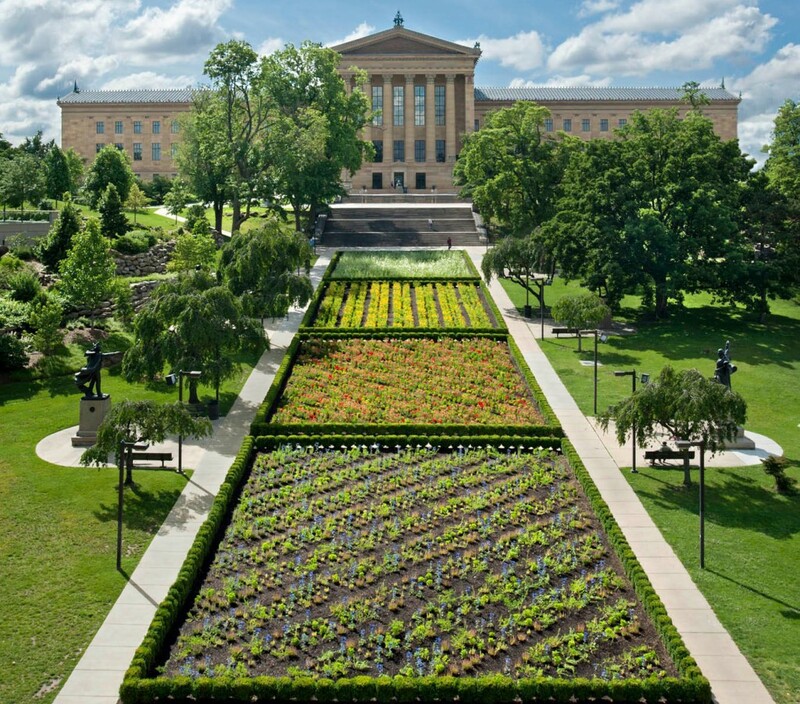 Being a fan of both old gardens and modern art I feel kindof ridiculously pleased that Sol Lewitt has made a garden. And that it's a parterre! Not himself of course, since he's been dead since 2007. 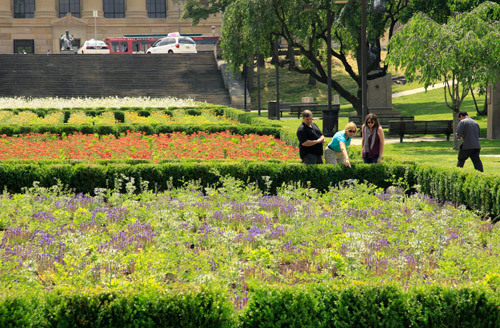 But his 1981 proposal for a parterre garden--his only garden plan--has finally been realized in Philadelphia's Fairmount Park. Those are pretty sketchy specifications. But Lines in Four Directions in Flowers was executed by OLIN to reflect Lewitt's "affinity for creating variation within a rigid structure", and for each of the color quadrants they selected "four to five species that bloom sequentially, with the lowest flowers blooming first. 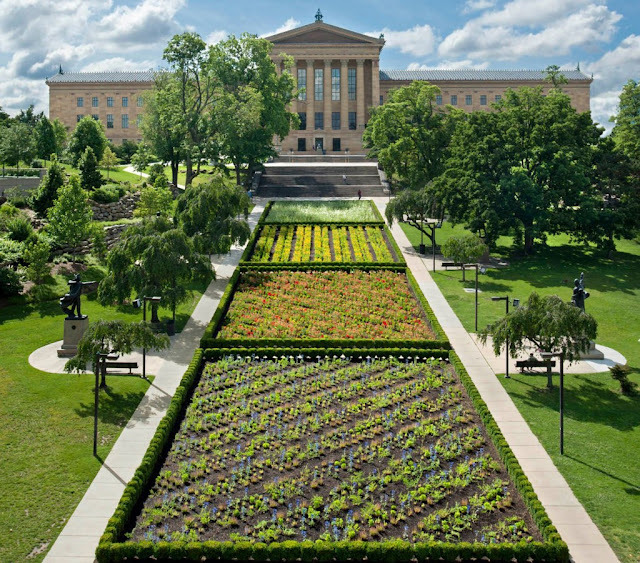 This pixelation of heights allows the negative space to be as impactful as the positive space—an extremely important factor to LeWitt. It's in place for two years. I will definitely be visiting. Have a look at the Welsh Historic Gardens Trust Website: http://www.whgt.org.uk - and their FaceBook page. They may be of interest to you and hlep us both with our researches. By the way I am a Committee Member of the Trust! Thanks David. I've added your link to the sidebar! 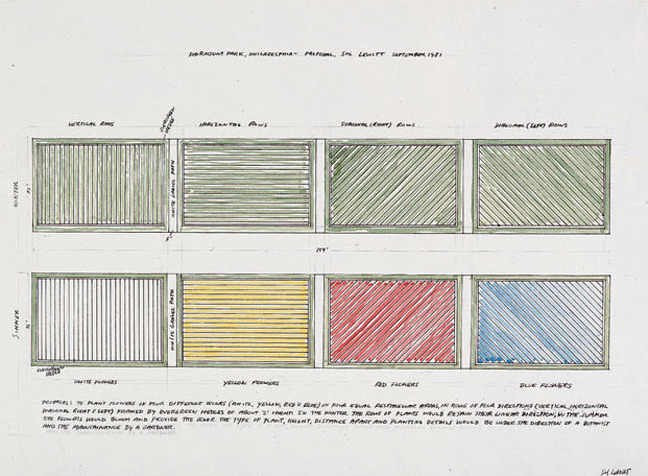 Thank you so much for reminding me of Lewitt's parterre garden. My husband just started taking a drawing class at our local community college and they began with a trip to the huge Lewitt exhibition at Mass MoCA - and then had to do their own project separating design from execution. I will pass this along. I love your blog!